You don’t have to hit the links when a golf course could be right in your own backyard. 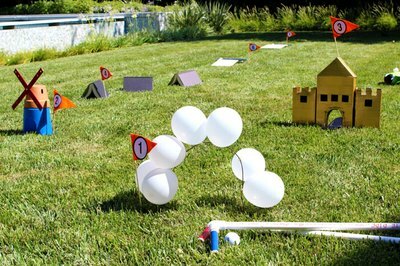 Using ordinary household objects to construct the course – like cereal boxes, cardboard tubes and books – you can create this fun and challenging 9-hole miniature golf game the whole family will enjoy. A balloon arch is a great way to start the course. 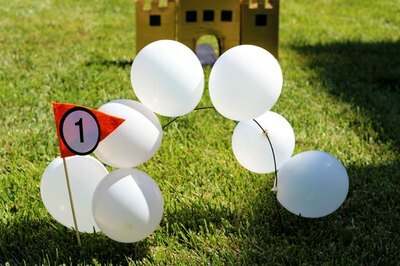 Inflate six to seven balloons and tie them to some wire. Bend the wire into an arch and insert the ends in the grass. It's just not miniature golf without a windmill. 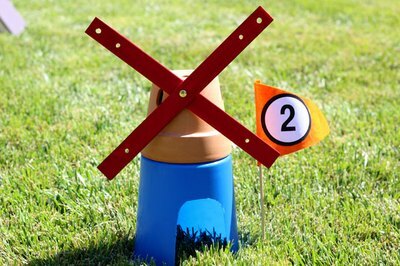 To create your own windmill, cut an opening on the top of a plastic bucket and position it upside down so the opening is on the grass. Place an inverted terra cotta pot on top of the bucket. For the blades, attach two criss-crossed rulers to the top of the windmill with some glue dots. A castle is another must-have. 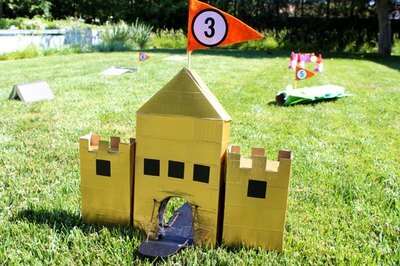 To make this design, you will need one large empty cereal box and two smaller ones. In the larger box, cut an arched opening at the bottom on both sides, but do not completely remove them, as they will be used for the drawbridge. Place a few rocks in the boxes to help them stay upright in the grass. Then cover all the boxes with duck tape. Cut notches at the top of the smaller boxes for the castle battlements. Fold down the doors you created when you cut openings in the large box, and add chains connecting the box to the door to finish the drawbridge. If you'd like, add a corner of an additional cereal box to the top of the castle for the pointed roof. 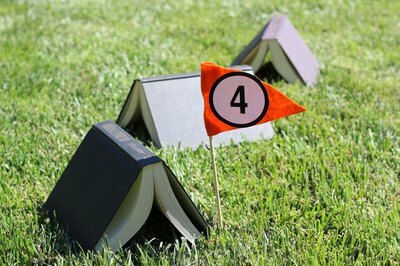 Place books upright like tents to create a maze or pathway for the golf balls. This alligator is hungry for golf balls. 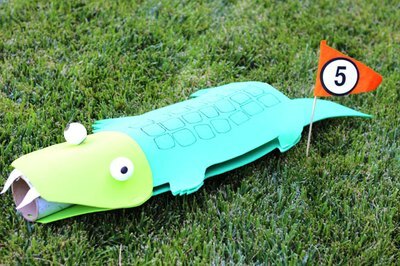 Cut out two alligator shapes from sheets of craft foam – one for the top and one for the bottom – and staple them together around a cardboard mailing tube. Add some felt teeth at the opening. Now try hitting the ball into his mouth. Let's make this a bit more challenging. To make a water obstacle, also known as "the drink," fill an aluminum baking tray with water. 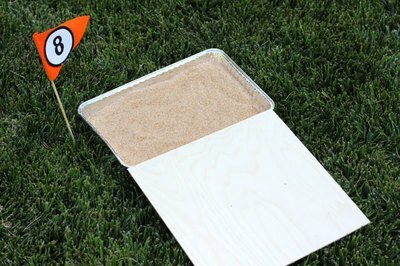 Place a piece of wood on the rim of the aluminum tray for the ramp, so the golf ball can fly over the water. 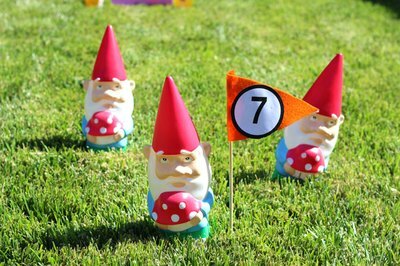 If you have gnomes or any type of garden ornaments, place a few of them on the grass as a maze that the golf ball must weave around without hitting or knocking them over. You've jumped over the water, but can you avoid the sand trap? 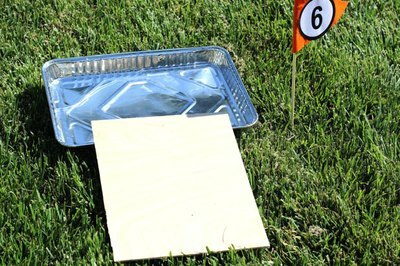 As with the water obstacle, fill an aluminum pan with sand, and place a piece of wood on the rim of the pan to make a ramp. The "19th Hole" is slang for the place you get a drink after a game of golf. And in this miniature golf course, the 9th Hole actually incorporates the drinks. Tie a string around the neck of two soda bottles to connect them and hang a piece of card stock on the string. This gate will swing open when the golf ball goes between the two soda bottles. 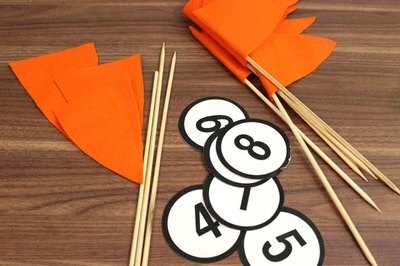 Print out some numbers on your printer and glue them to some felt triangles. Then glue the felt to wood skewers, which you can use to insert into the grass at each hole. 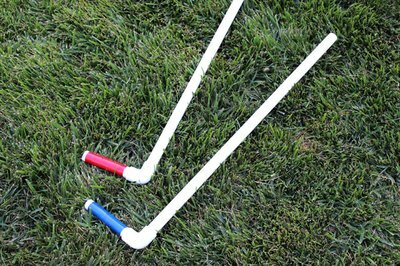 If you don't have putters, you can make your own with 1/2" PVC pipe and elbow pieces. Wrap duck tape around the PVC pipe to color code them. Now all you have to do is... have fun!